Founded in 649 B.C., it was one of the most thriving Greek colonies in Sicily and together with Selinunte, it was the westernmost Greek centre; fragments of columns and the lower part of the Temple of Victory naos are still visible, together with the remains of some neighbourhoods. 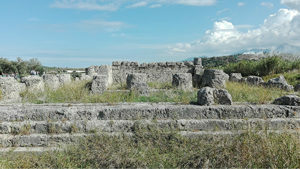 The Archaeology Institute of the University of Palermo has been carrying out excavations for some years now, aiming at combining archaeology lessons with on-site research. The archaeological findings of this site are displayed in the antiquarium (museum housing findings from the nearby sites).